The impressive thirteenth century remains of a castle built by the native Welsh Princes and abandoned, rather than modified, by the English. The ‘D’ shaped tower is a particularly fine example of this unique Welsh design. There is a plaque adjacent to an old bridge over the Wepre Brook commemorating the Battle of Ewloe. Notes: The castle is found in Wepre Park - a woodland area which is accessed from a footpath leading off from the B5125 (North-West of Ewloe). Lay-bys, sufficient for multiple cars, can be found on both sides of the road. Ewloe Castle Layout. The castle seen today was probably built by Llywelyn ap Gruffudd. Positioned on top of a rocky knoll near the convergence of the Wepre and New Inn Brooks, it was always surrounded by woodland although presumably the immediate approach to the castle was cleared to ensure uninterrupted views. Welsh Tower. 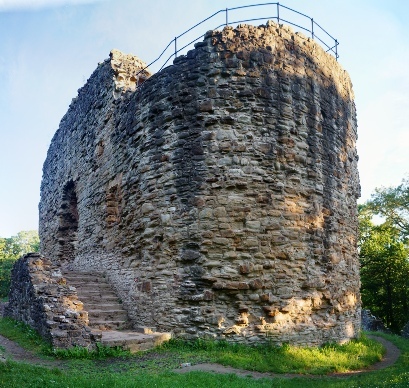 This tower dominated the Upper Ward fulfilling the roles of both Keep and Great Hall. The ‘D’ shaped design for a standalone defensive structure was unique to castles of the native Welsh Princes. Battle Plaque. A small plaque can be found near the bridge over the Wepre Brook. Please note that whilst the bridge is clearly old, it does not date back to the battle. 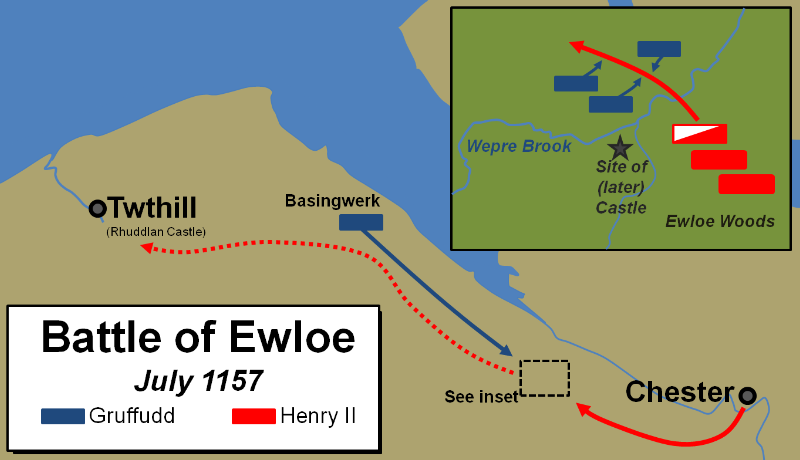 The Battle of Ewloe (1157) saw the Welsh rulers of Gwynedd defeat a Norman-English army commanded by Henry II. Ewloe Castle was built shortly after and remained a stronghold of the Welsh Princes until Edward I’s 1276/7 conquest of eastern Wales. Thereafter it was abandoned in favour of coastal sites that could be easily re-supplied by sea. In the twelfth and thirteenth centuries Ewloe was a heavily wooded area near the main road from Chester into North Wales. In the years after the Norman Conquest the area had fallen under the control of Marcher Lords, but the political turmoil of the Anarchy – the Civil War between Queen Matilda and King Stephen over the English succession – had enabled the native Welsh to re-assert themselves. Owain ap Gruffudd, King of Gwynedd (Owen the Great) had expanded his power at the expense of both the Marcher Lords and other Welsh Lords and in particular he had taken Rhuddlan Castle (the motte-and-bailey castle at Twthill rather than the later Edwardian fortification) in 1150. Henry II had ascended to the English throne in 1154 and immediately sought to restore Royal power which had been extensively eroded during the Anarchy. In Summer 1157 he launched a major expedition into North Wales to defeat Owain ap Gruffudd. A naval detachment under Henry FitzRoy attacked Anglesey, the bread-basket of the north, whilst the King himself advanced from Chester with a large field army (perhaps 30,000 men strong). Henry's intent was to re-take Rhuddlan Castle. However Owain had assembled a small force, possibly a mere tenth the size of Henry's, but was at Basingwerk and blocked the English King's approach. Henry sent a large force into Ewloe wood to flank round the Welsh forces. Moving into such terrain favoured the Welsh and Owain sent a significant portion of his troops into the woods and ambushed the English. The Welsh action was successful and the English detachment was routed. Henry II himself was almost killed in the fighting and only saved by the actions of Roger de Clare, Earl of Hertford. Despite the Norman-English rout, which was compounded by the defeat of the Naval detachment at Anglesey, Henry's superior numbers enabled him to continue onto Rhuddlan prompting Owain to make peace with the King. The heavy cost to his vast army was a humiliation for Henry II and one that seemingly left its mark - he would attempt to invade Wales again in 1165 but crucially chose not to follow the same coastal path that he did in 1157. Instead he advanced over the Berwyn Hills where he was defeated by the weather. 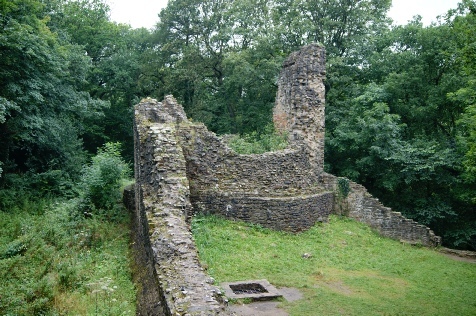 It is not clear when the first fortification was built at Ewloe. The castle seen today was constructed around 1257 by Llywelyn ap Gruffudd, Prince of Wales. During this time he had benefited from Henry III's weak rule and later his distraction with the Second Barons War - in which Llywelyn enthusiastically supported Simon de Montfort, Earl of Leicester’s rebellion. 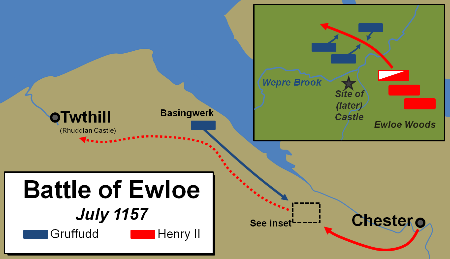 Despite the defeat of the rebels, the English King sought peace and sealed the Treaty of Montgomery (1267) which confirmed Gruffudd's rule over the lands in which Ewloe stood. Ewloe Castle was one of the last built by a native Welsh Prince and demonstrates the traits of their designs. The massive 'D' shaped Keep, built on top of a rocky knoll, was the centrepiece of the defences and surrounded by a curtain wall enclosing an Inner Ward. A circular tower formed the western defences and was part of an Outer ward. The castle was positioned in a wooded valley at the junction of the Wepre and New Inn brooks. Edward I invaded Wales in 1276 (the First War of Welsh Independence) seizing all territory east of the River Conwy including Ewloe. Whilst the Welsh castle seems to have been occupied by English forces, its use was short-lived - instead Edward I raised new state-of-the-art castles at Rhuddlan and Flint which could be easily re-supplied by sea. Ewloe Castle had been abandoned by 1277 and over the subsequent decades and centuries its stonework was robbed for other projects leaving the ruin seen today.